King Charles' organist Michael Bacon ends his journey through the complete Bach organ music - over 300 pieces - with a short recital including the great Passacaglia in C minor. This is a short recital of around 35 minutes. Information about concerts in 2014 will be available soon! Many thanks to all the performers for a thrilling evening! Audience comments: "Absolutely fantastic concert. Still buzzing from it all"; "we felt privileged to be able to attend such a performance, literally down the road from where we live"; "the best yet at King Charles, and so moving". On Saturday 26 October, at 7:30pm, we provide a rare opportunity to hear two of the most famous and ground-breaking works of the Twentieth Century. This is a concert that has to be experienced! Messiaen's Quartet for the End of Time played by Thomas Bowes (violin), Tim Lines (clarinet), Eleanor Alberga (piano) and Tim Gill (cello). Tickets: £15 (£12.50 in advance, from Hall's Bookshop or by emailing kcmconcerts@blueyonder.co.uk). No charge for under-18s. The venue: King Charles the Martyr church is in the heart of the old town in Tunbridge Wells, post code TN1 1YX. "At the beginning of 2006, inspired by my work on Radio 3’s week-long broadcast of the complete works of Bach, I decided to play all his organ music. Why? Because it is the most incredible collection of pieces in the repertoire, not only for the organ, but any instrument. 300 works in all, filling between 19 and 22 CDs, depending on the player. I have written before of my passion for Bach’s music – not only is it hugely inspired, written with a level of mathematical skill which is comparable to the most complex nuclear physics, it is full of joy and humanity. If you think it is dry, or dull, blame the performer. In fact, that’s why, until that point, I’d avoided playing Bach, knowing I’m not worthy of it. Discussing it with a friend, he said that it was a silly reason not to get to know, close up, some of the very greatest art. So, I took up the challenge, giving myself 10 years to play every piece, in public. Almost all of this has been at KCM, and I’ve tried to play music appropriate for the liturgical season, and the mood of the occasion. Every single one has needed at least a few days’ work – some several weeks, so I’m glad I gave myself a decade to do it. I’d always planned to finish with the great Passacaglia and Fugue and that is what I’m going to do, just over two years before my deadline. It’s been wonderful to do, getting to know many pieces that I’m not sure I’d even heard of. The music is so complete, and I enjoyed the challenge of the Trio Sonatas (three independent lines, one for each hand and one for the feet, like three friends playing together)so much that I have (almost) kept my 2013 New Year’s Resolution to play one every day. I still don’t think I’m worthy, but I do think I’m a better player because of the discipline of having to keep everything clear and controlled. I’ve also been grateful for the interest and support shown by members of the congregation, friends, and colleagues at work and I hope that some of you will be able to share the end of this journey by coming along on 24 November. Admission free. What am I going to do next? No question – do it all again." Booking for concerts this season is now open. There's a distinct 20th century flavour to the series, as we celebrate a number of anniversaries. Follow the links for more information. To book tickets, email kcmconcerts@blueyonder.co.uk or pop in to Hall's Bookshop on Chapel Place. 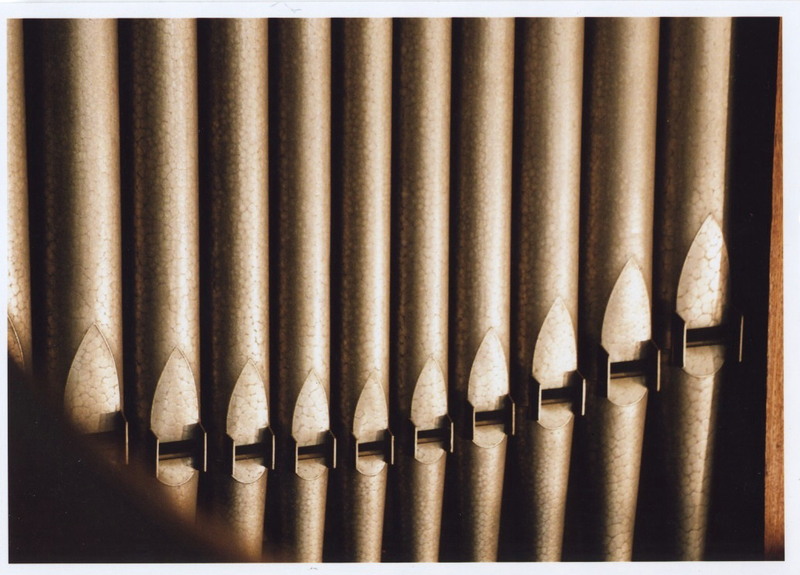 Saturday 7 September, 7:30pm Celebration Organ concert to celebrate the church organ’s 75th anniversary. Saturday 26 October, 7:30pm Messiaen and Stravinsky: The Rite of Spring for piano duet, played by Anthony Zerpa-Falcon and Jong-Gyung Park Messiaen's Quartet for the End of Time played by Thomas Bowes (violin), Tim Lines (clarinet), Eleanor Alberga (piano) and Tim Gill (cello). Music at King Charles is currently not supported by any grants or sponsorship. Your support by attending these concerts and telling others about them is warmly appreciated. As well as being one of the most ambitious programmes put together by Music at King Charles, this is a rare and exciting opportunity to hear two of the most famous and influential works of the last hundred years. While the first performance of Stravinsky's ballet famously started a riot at its first performance, in Paris, Messiaen recalled that at the first performance of the Quartet, "never was I listened to with such rapt attention and comprehension". The circumstances of these two events could hardly have been more different, however. While Stravinsky's work was provocative for a wealthy Parisian audience at the Opera, Messiaen's work was first heard by his fellow prisoners at Stalag VIII-A, the Nazi concentration camp where it was composed. 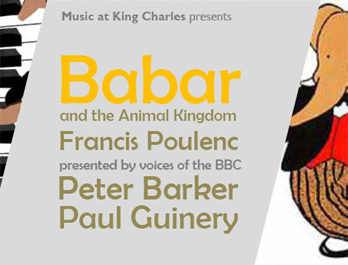 Well known to listeners of BBC Radio, announcers Peter Barker and Paul Guinery team up to present an afternoon of music and readings based around "Babar the Elephant" by French composer Francis Poulenc. Their witty and sophisticated afternoon programme will appeal to all ages (this is not a children's concert, though surely children will enjoy it). As there is no charge for under-18s, maybe it's something you would like to come to as a family? Tea will be provided after the concert, which should last for about 80 minutes. Tickets cost £12 on the door, but may be purchased in advance from Hall's Bookshop or by email from kcmconcerts@blueyonder.co.uk for just £10 (and remember that there is no charge for under-18s at any of our concerts). Paul Guinery writes: Francis Poulenc is one of the most approachable and engaging of all the great 20th century French composers. He was an excellent pianist and the instrument features a great deal in his works, not only in solos and concertos but also in a remarkable repertoire of songs. His output was large and varied, including chamber music featuring wind instruments in particular; music for the theatre, in the form of incidental music as well as several operas; and choral music such as his popular setting of the Gloria. Poulenc’s temperament was distinctly two-sided: on the one hand, there was the gregarious and genial bon viveur, delighting in all that Paris had to offer in the way of entertainment; on the other, the anxious melancholic whose love-life was often troubled and frustrating. His music is modern in style but, apart from some very early works, always tonal and often full of a sensual warmth and humanity. The musical ‘illustrations’ for Jean de Brunhoff’s book, a children’s classic in France, were originally just improvised for young friends and relatives. 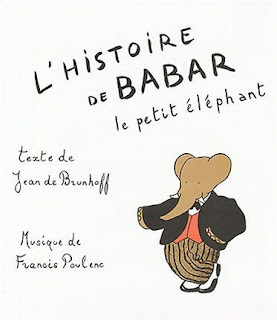 Fortunately for posterity, Poulenc wrote them down in 1945 so that we can now share his enchanting vision, never sentimentalized, of the orphaned Babar who discovers the delights of being an elephant-about-town, but ultimately finds fulfilment back in the forest where he grew up. Babar will be joined later by other members of the animal kindom, evoked through a selection of words and music, and this afternoon’s performers will introduce those items individually. PETER BARKER At the age of eight somebody thought Peter’s voice was worth training and he spent his early years as a member of a cathedral choir. Afterwards, two years at RADA led to a career as an actor in repertory and touring theatre companies. A chance opportunity to join the BBC resulted in his becoming one of the daily voices of Radio 3, with the job of introducing all kinds of music, both from discs and live from studios and concert halls all over the world. For some years announcers were encouraged to fill gaps between programmes with readings of poetry and prose of their own choosing. This gave Peter the chance to develop and communicate to his audiences his love of literature. And this is what has been at the forefront of his collaboration with Paul Guinery, whom he met while they were both at Radio 3. Following the success of their first interpretation of Babar, they were encouraged to seek out other members of the animal kingdom and to put together the programme we are to hear today. PAUL GUINERY Paul Guinery studied the piano at the Royal College of Music where he was awarded an ARCM; he went on to read for a degree in Modern Languages at Oxford. 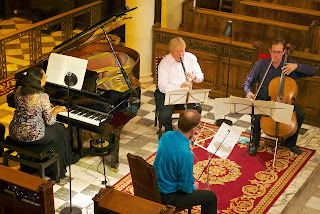 Paul has worked extensively with the wind quintet Harmoniemusik, which runs its own festival each summer in St.Columb, Cornwall, where he’s performed chamber music of all sorts, as well as piano concertos by Bach and Mozart. The group has issued a CD of music for piano and wind and plays regularly in London at city churches, the Art Workers’ Guild and Conway Hall, and has toured in the UK and abroad, including three visits to the Oloron Festival in France. 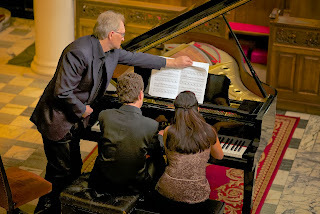 Paul gives occasional solo recitals, and has recorded CDs of music by Rachmaninov, and by 20th century English composers. He’s also been musical director for Gilbert & Sullivan operettas; has played for cabaret at the Savoy Hotel in London; and in currently working on a book about the composer Frederick Delius, for publication next year. Like Peter, he was a staff announcer for Radio 3, and can still be heard on air as a newsreader. A varied programme presented by The King Charles Singers and others, celebrating the centenary of the birth of Benjamin Britten, featuring the well-known anthem Rejoice in the Lamb, which is based on the poem Jubilate Agno by Christopher Smart (1722-1771). 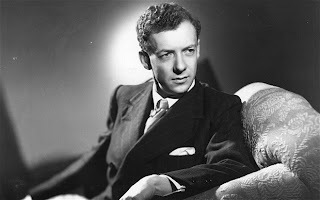 As well as music by Britten, there will be works by other English composers, with a combination of choir, soloists and instrumentalists. Among other pieces, we are delighted to welcome harpist Ellen Smith, accompanying extacts from Britten's Ceremony of Carols. Tickets are £12 on the door, but just £10 if purchased in advance, from Hall's Bookshop or by emailing kcmconcerts@blueyonder.co.uk. Past and present Organists from the church celebate the exact 75th anniversary of the dedication of the magnificent Walker organ. 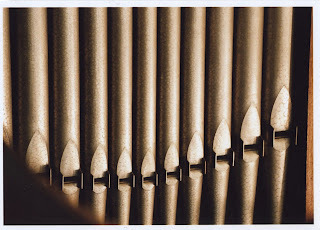 Michael Bacon, Robin Hepburn, Paul Jeffery, David Maw and Jonathan Roberts will play some of the music played in some of the 'opening concerts' in the history of the organ - 1862, 1909, 1938 and 1987. Leon Boellmann's Gothic Suite and Cesar Franck's 3rd Chorale sit alongside music by Handel, Whitlock and Walton. This concert launches a major fund-raising campaign to prepare for essential repair work to the organ. Further information about the campaign and the work required is available from the Parish Office and enquiries are very welcome. Admission free: retiring collection for the organ fund. The King Charles organ is 75 years old in 2013, and one of the most exciting instruments to play and listen to in Tunbridge Wells. Hear it put through its paces in three short concerts on Sunday afternoons. Each performance is around 40 minutes, and takes place before the evening service. There is no admission fee, just a retiring collection. The Pentagon String Ensemble is a group of musicians who have held Principal positions in some of the country's leading orchestras including the Royal Philharmonic Orchestra and Northern Sinfonia. They have performed chamber music together for many years at venues and festivals around the UK and abroad. The programme includes music by Schubert, Mozart, Sibelius, Howard Blake and Beethoven. More information. A Night at the Opera. 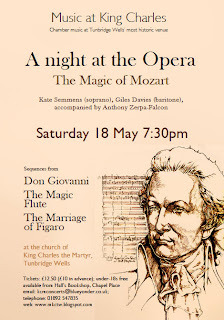 Soprano Kate Semmens and baritone Giles Davies present “The Magic of Mozart”, with accompanist Anthony Zerpa-Falcon. This imaginative programme includes a sequences and complete scenes from Don Giovanni, The Magic Flute and The Marriage of Figaro. 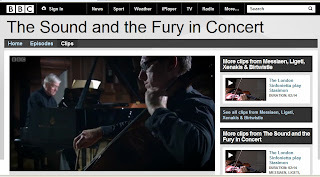 Anyone who is enjoying the current BBC Four programmes about 20th Century music might be interested to know that plans afoot for a significant series of concerts in Autumn 2013 at King Charles. We are hoping to present the music of Poulenc, Britten, Stravinsky and Messiaen in three concerts, starting in September. Keep an eye on this site for more news! In the meantime, sit back and enjoy three minutes of eternity with this extract from Messiaen's Quartet for the End of Time. Announcing details of the next concert in 2013. 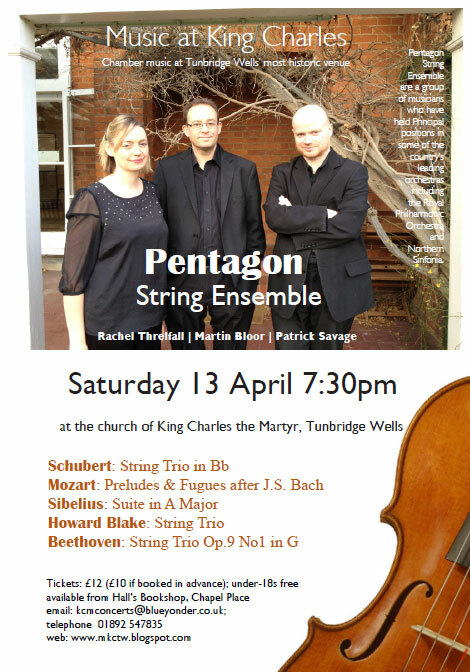 The Pentagon String Ensemble are a group of musicians who have held Principal positions in some of the country's leading orchestras including the Royal Philharmonic Orchestra and Northern Sinfonia. 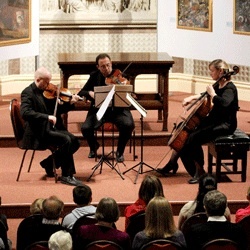 They have performed chamber music together for many years at venues and festivals around the UK and abroad.